Halloo - What is a Hunt Group? A hunt group is a type of extension that distributes calls to members of a group. Each extension will be tried in order until someone answers. Users will be skipped if the person is currently on the phone or has marked their extension as “blocked” from the hunt. (See the Quick Reference Guide section of the Support pages for details about blocking calls from hunt groups). Hunt groups may be searched sequentially or round robin style. A sequential hunt always starts with the first extension in the list, and works down. Round robin distributes the calls evenly amongst the members of the group by rotating the group member whose extension is tried first, then searching down the list in sequential order. Create a hunt group extension on the Extensions page in My Halloo. 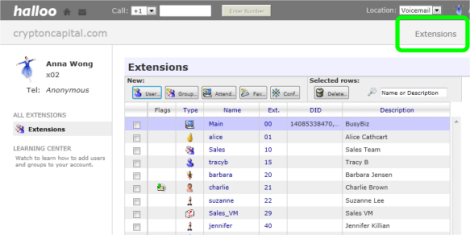 Note that you will assign a unique extension number to the group, just as you would with user extensions. Click the [New Group…] button on the Extensions page. Fill in the description, name, and extension number as requested in the form (e.g. Support, ext-90). Connect the new hunt group to your existing menu structure by adding a keypress or timeout event. For example, “Press 2 for the next available support agent”. Configure the new hunt group by clicking on its name in the Extensions list. Add user extensions to the group, by choosing a name from the menu and clicking the [+ Add] button. You can use the up and down arrows to arrange the routing preference for your group. Choose Sequential if you want calls routed as listed, or Round-Robin if you want each subsequent call to start with the next person in line to more evenly distribute calls. If no users are available, the caller will reach the voicemail box of the extension set in the “Voice mail if no one available” field. If you choose to omit this setting, callers will be directed to the voicemail box of the last user extension in the Hunt Group sequence. Hunt groups are only useful if you have at least 1 user extension designated, in addition to the Default extension. (If you choose to omit the Default extension, you will need at least 2 user extensions.) With only a single user extension and no distinct Default extension, the hunt group serves no purpose not already met by the user's individual Forwarding preferences. If you would like to use a hunt group to “follow” a single user to multiple locations, you may. To accomplish this, you will need a different user extension set up for each of your possible locations. Set up a hunt group with these distinct extensions in the order you would like the system to hunt for you. Enter your main voice mailbox as the Default extension.